Voted Miami's Best Reggae Night. 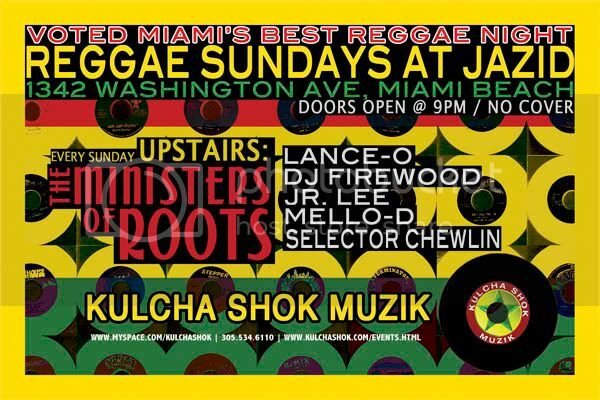 Two floors of reggae music every Sunday. Reggae band Jahfe playing live downstairs and upstairs tunes by Kulcha Shok Krew with special guests each week. Breaking news Wal-Mart fraud cover scheme unfolded. Late Tuesday the F.B.I pulled the plugs on the corp store in Miami. There were allegations the 15 year business community utilised the wm store property and Franchise to extort millions of merchandise and funds to give to the esatern and Caribbean community's in the surroundings area. The store has all off the merchandise from a merchant that sells Target.com Target Stires and OverStock thier 10.,000 product inventory stock mostly made up of toys and children supplies furniture and clothing. Are the club owners rating this place? its DEAD inside! The live band has a few followers, mostly Rasta imposters, but upstairs is EMPTY! not what it USED to be a few yrs back, unfortunately. PLUS a cover charge...Sorry Jazid,you need to step your reggae game up! how old do you have to be for this club ? Awesome place to vibe out and chill. Wicked culture tunes from the 70's all the way until present day. DJ is BAD! Always plays the hottest tunes guaranteed. Live band downstairs with one bar and restrooms. Upstairs - behind the heavy black drape - projector screen on the wall, lounge area with a few tables, candles, a couch and some chairs. Also, one bar on the upper level. They play tunes all night past 3 am. Article Place, Irie Vibes, Music Nice, Lovely People...:).. This is a guarantee hot spot in SOBE on sundays! im there every saturday. n it dun matter upstairs or down u will definetly feel the vibe.people of all ages n nationalities uniting to enjoy the tunes! big up to the entire kulchashok crew. p.s. go bu 1 of da bands cd's it's worth it!!!!! !